In less than one week my kids will be starting school! I can’t believe it. Where did the summer go? Instead of having fun by the pool, our week has been filled with appointments, and of course, lots of shopping. 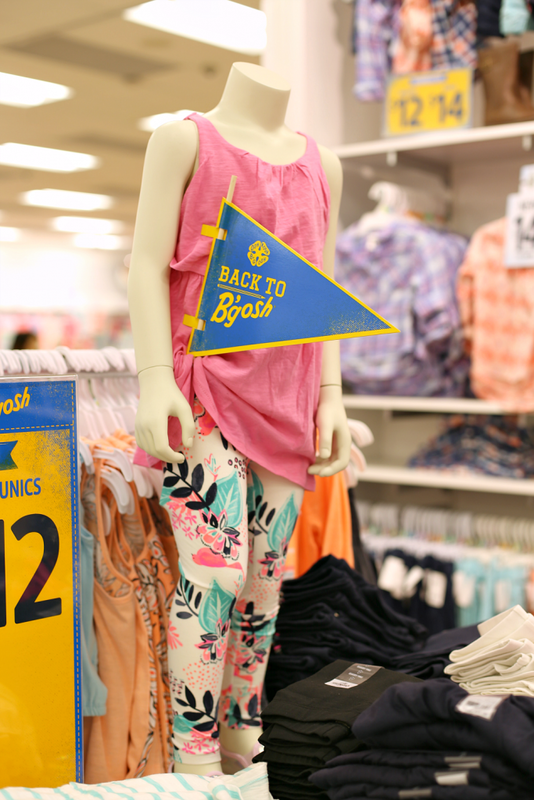 We were already planning a trip to Denver to shop for back-to-school items, so it was perfect timing when Colorado Mills invited us to come in and shop the back-to-school sales. 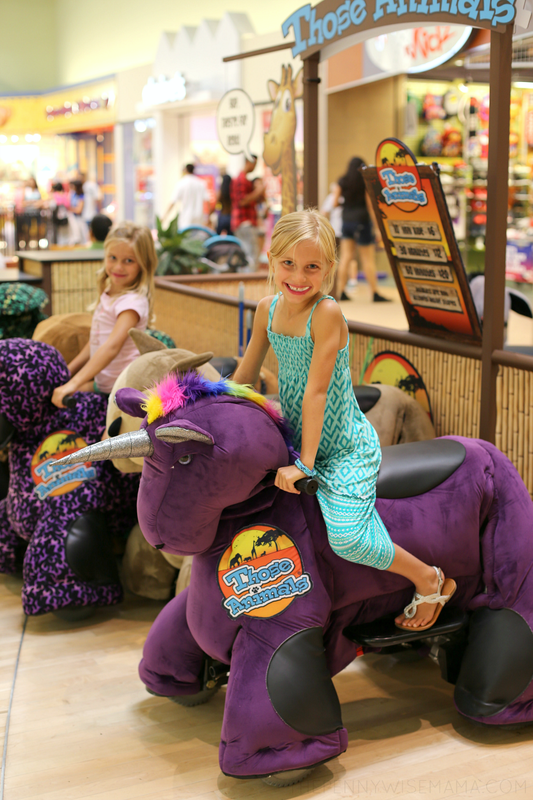 We took a trip down to the mall the other day, and not only did we find some great deals, we had a lot of fun! If you’ve never been to Colorado Mills, you’re in for a real treat. It’s not like other malls. It’s unique in that it is Denver’s only indoor outlet mall (yay for great deals! ), and with the largest variety of stores and fun activities for kids, it is a great place for families. You’ll find a wide variety of dining options when you get hungry and a movie theater if you need to take a break from all the shopping. There’s something for everyone and that’s what makes it a great shopping destination. Left: tunic & leggings, OshKosh // Center: shirt & pants, PacSun // Right: tunic & leggings, OshKoshBuying new clothes every school year really adds up! This year my son will be a freshman in high school and my twin girls will be in first grade. My girls have to wear uniforms to school, so we end up having to buy clothes for school and clothes for dress-down days and the weekend. It’s nice that Colorado Mills has all the stores my kids love — OshKosh, Children’s Place, GAP Factory, Pac Sun, American Eagle and Nike Factory Store. There’s even my favorite, Target! It makes it easy to get all of our shopping done in one place. 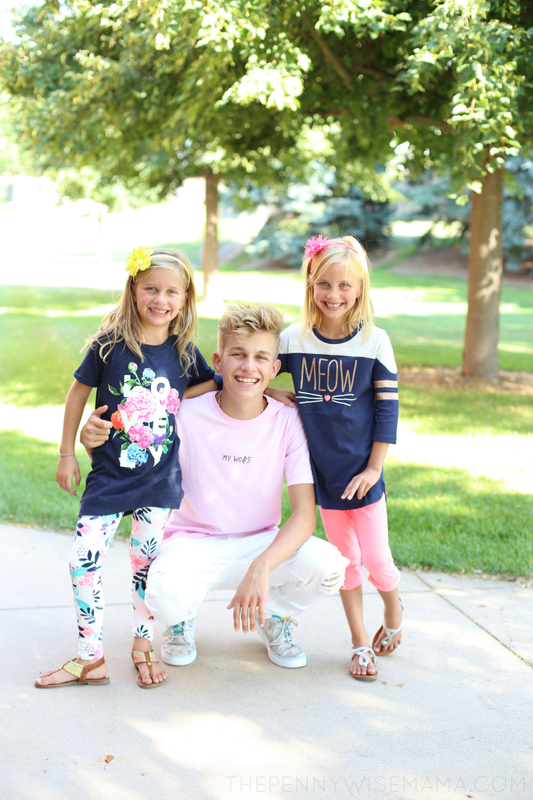 Now is a great time to shop for back-to-school clothes and shoes at Colorado Mills. Many of the stores are offering deals such as buy one, get one, as well as percentage discounts to help you save on all of your back-to-school shopping. For example, OshKosh B’gosh is offering 40% off select items and they also have some great Doorbuster Deals — $12 tunics, $6 leggings, $8 denim and bogo shoes. One of the most expensive parts about back-to-school shopping is buying everyone shoes. To help save us money, I like to take advantage of buy one, get one deals. This works out great because then everyone can pick out two pairs such as one athletic and one casual/dressy. We found some great shoe deals like Buy One, Get One 40% off sale at Stride Rite. We also found some great deals at Children’s Place. I was able to buy most of my girls’ uniforms there, as well as some cute graphic tees and jeans for under $100. My twin girls love to shop, but they tend to get bored easily. 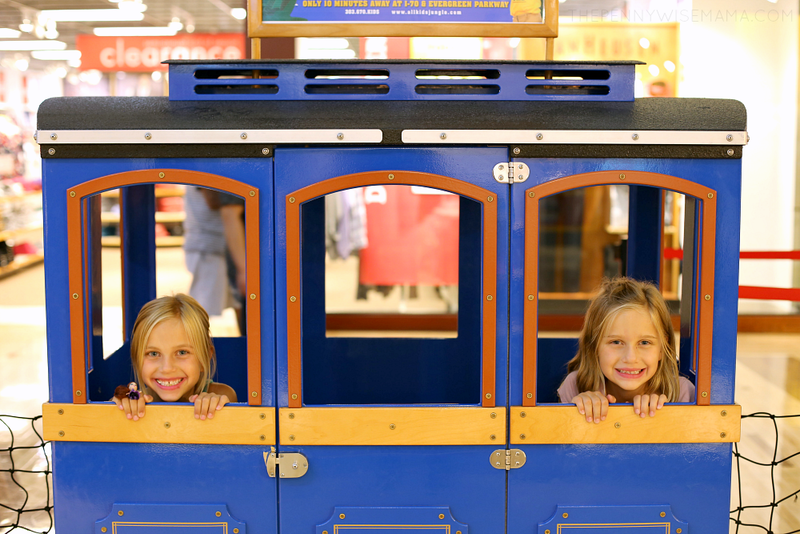 Thankfully, Colorado Mills has plenty of fun things for kids to do. They can take a train ride around the inside of the mall, play glow-in-the-dark mini-golf, ride the carousel and bungee trampoline. When my twin girls got tired of shopping, we took a break and let them ride the train and practice doing flips on the bungee trampoline. They also loved the large, ride-on stuffed animals. They had so much fun and have already begged to go back! As you do your back-to-school shopping, make sure you check out Colorado Mills. I think you’ll like what you find! Who is excited for an AMAZING giveaway? Our friends at Colorado Mills have generously offered to give away a $500 Visa gift card to one lucky PennyWiseMama reader. The gift card can be used anywhere, although Colorado Mills would love if you used it at one of their stores! Simply use the Rafflecopter form below to enter. It is mandatory to follow Colorado Mills on Instagram; all other entries are optional. Enter daily for more chances of winning. Giveaway ends on 8/24 at 11:59 PM MST. Open to U.S. residents only. Good luck! My oldest son is in college and I would use the gift card towards his books or college costs. I will use it to purchase back to school clothes and materials. It would help pay for gas and expenses for our next road trip. I would use it for clothes and supplies and a few extras for the teacher since everyone knows the the teachers spend their own money on extra classroom supplies. I would save it for our family vacation expenses. I would use the prize towards back to school charges and shoes! Thanks for the chance ! It will be a big help for back to school clothes and shoes for my girls ! Thanks for the chance !! I would spend it on spinner luggage. I would probably use it mostly for groceries and clothes for the children. I would spend the $500 on back to school supplies and a new living room area rug. Stock up on sale items and go out with the family for a nice dinner, not to expensive of course. Need to keep an eye on the budget. I would buy back to school clothes, school supplies! I would use it to buy gifts for my family. I would spend the $500 on a fun BTS weekend with my son. I would also buy some groceries so he can have healthy lunches while he’s there. I would spend it on back to school clothes, the kids are growing like weeds! I would buy fall/winter clothes for the grand kids. I would love to get some new furniture for outside. If I won, I would probably spend the gift card on some back to school clothes for my grandchildren. Thank you so much for having this giveaway. If I win, I will spend the $500 gift card on traveling home for Christmas. I would use it towards school supplies and clothing for my son. I would also use it to help my friend with her kid’s clothing for school. Thank you so much for this chance! If you win, what will you spend the $500 gift card on? I would use it towards weekend getaway to the NC mountains! I would use it to purchase a home computer for my daughter to do her school work! this would be a huge help to get groceries for my daughter and myself. fingers crossed! Omg, what wouldn’t (i want) to spend this on! I would use it mainly on my 10 year old daughter’so back to school clothes shopping and my 3 year old’son fall/early winter clothes and sneaker shopping…..and if there was anything left for me, i would love to get a pair of boots…. 🙂 we have been going thru kind of a rough time, so this would be amazing for all of us! I may even save a little of it to help with Christmas! I would buy fall clothes for my 4 kids. I would buy school supplies and school clothes. Thanks! I am buying School Clothes! I will buy pants, shoes, backpacks and every thing else for back to school shopping. If I win, I will spend the $500 on a gaming console. I would buy some clothes and also on Christmas shopping. It would go towards paying bills. I would put it away for Christmas gifts. I would use it on books and clothes for the kids. My kids could use new fall clothes. I would spent it on my kids back to school supplies,their shoes and clothes. I will be buying a lot of back to school items if I win!! If I win, I will spend the $500 gift card on new car tires. Back to school supplies and clothes for my granddaughter. I would use it for back to school shopping and maybe a desk for my daughters room. If I won I would buy groceries and back to school clothes. I have finished my kiddo’s college shopping so this would be for ME! And I can really use some new clothes! I’m ready to move out of old jeans and tshirts. I would use it for back to school clothes for the family. My youngest daughter is in college. So probably textbooks and things she needs. Thanks! I would buy a Wii U for my daughter’s birthday. I will be spending it on Back to School! Thanks for an awesome giveaway! School clothes and supplies are a big must right now. I’d take my hubby on a 3 day weekend get away. With our only child going to college this month, we have time to be spontaenous! I will spend it on the grandkids. I could use the $500 towards our next family vacation. I will be buying all my back to school items if I win! Thanks for an awesome giveaway! I would use it for school clothes for my grand child to help my daughter out. I will spend it on fall clothes. School supplies and clothes for my son and a few more kids that need the extra help. Thanks for the chance! If I win, I will spend the $500 gift card on bills. I will spend it on new shoes and pants. If I were to win I would go clothes shopping and use some for Christmas shopping. i would buy school clothes for my 3 kids. I would use it to get started on some early Christmas shopping! Thank you! I would buy a chandelier for my daughter’s bedroom. If I win, I will spend the $500 gift card on clothes for the family. i would use some for christmas and some for back to school shopping for my 3 kids. I will buy things for the grandkids. I would use it on clothing! I would use the gift card to buy my grandkids their school clothes and supplies. I would use the gift card to do my Christmas shopping. The $500 gift card would be great to buy fall clothes. School school and school :). Thanks for the chance! I am getting a lot of new back to school items. Thanks so much for fun giveaway! I would buy my son clothes and shoes and use some for Christmas gifts. $500 could really help pays some bills! With $500 I’d purchase a laptop for my husband! I would buy the kids some new clothes with it if I won! If I were the lucky winner I would Christmas shop early. If I win, I will spend the $500 gift card on new lamps. With 4 kids I’d use the gift card to purchase back to school supplies for my 1st 2nd 3rd and 4th graders! I’d purchase school clothes for my 1st 2nd 3rd and 4th graders! If I win, I will spend the $500 gift card on groceries. my daughter needs new winter clothes so this would help buy those. It would be great to win this to buy fall clothes. This would be so great to win for school supplies! I am buying back to school clothes and supplies!! i would spent it on my 3 kids back to school shopping,thank you for the chance! I would use the gift card for some clothes and birthday and Christmas gifts. I would buy back to school clothes and supplies. I would use the money to purchase myself clothes. Now that school shopping is over, this mama could use some new duds too! If i win, which I really, really, really hope I do—i would buy much needed clothes and sneakers for me and my 2 daughters…..going thru one of the roughest times I’ve ever endured in my adult life and it would help beyond words…. I’d also buy some of my 10 yr Olds bts supplies and clothesee with it! Ty! Id love to buy my daughter some new winter clothes and this would be a huge help. I would spend it on clothing and other back to school items for the kids. I would buy clothes for the grandkids. My kids really need some new school clothes! I will be getting a lot of Back to school items with this money! Back to school supplies for my son and others. 8/12 I’ll buy fall clothes. I would buy fall clothing if I won. since scholl is behind the corner i would buy school clothes for my 3 kids if i won. If I win, I will spend the $500 gift card on a new TV. I would use it for some Christmas shopping. If I win, I would use the money towards a new kitchen table & chairs. I would buy school items for the grandkids as well as put some of it towards my cancer treatments. I would buy spinner luggage for our trip in September. I would use it for some early Christmas shopping! I would spend this on books, games, and school supplies for homeschooling my five year old this year. I am going to be buying some awesome school supplies! I would love to buy some new clothes for the kids for fall! I would spend it on spaying a feral cat since I feed a colony, some others need vet work, and if anything is left over I need new gardening gloves. I would spend it on school clothes for my granddaughter as well as pay a medical bill or two. If I win, I will spend the $500 gift card on getting my car ready for winter. This would help buy Christmas presents. I can also donate to my son’s school. I’m sure they could use some more supplies and backpacks. I would use it to buy a new computer. I would spend it on cat food to carry through the winter and another heated water bowl for the feral cat colony. I would use it to buy stuff for my family. I may put it towards a cell phone, I don’t own one. I would spend it on fall clothing for myself and my family! If I win, I will spend the $500 gift card on a new laptop. I would buy fall clothing for my kids. I will be buying some nice School clothes! We are certainly ‘pennywise’ in our house. I have already bought school supplies and am slowly trying to get clothes and shoes but it can be tough on a budget. If I were to win the giftcard it would be amazing because I could buy all of the essentials and clothes without worry at my local Simon mall here in Charlotte. Every year I get atleast a couple of things from Oshkosh because they have the cutest outfits and shoes plus they have good sales often. I would save $150 to put towards Christmas also. this would be a huge blessing buying groceries and other needs for my daughter and me. I would buy clothes and shoes for my son and grandsons and use some for Christmas gifts. I would spend it on back to school clothing, supplies, and maybe some groceries. I’ll use it to pay off medical bills and maybe save $25 for a dinner out! I could also use it towards groceries for bagged lunches for my son this year. I would use it to repair the dent on my car’s fender. Nothing exciting as it would get used for groceries and clothes for back to school. I would be buying my granddaughter the items she needs for school. If i won, which would be a total blessing, i would buy my 3 year old her fall/winter wardrobe plus some new sneakers and boots which she really needs. I would also buy my 10 year old daughter her bts, or at least some/most of her bts wardrobe. And if there was anything left over, odd like to treat myself to a pair of cute boots and jeans. Ty so much for the chance! I would use it for my grandchildren’s school supplies. If I win I would love to use it to get some furniture for my sons rooms like a desk. I would spend it to help feed the feral cats this winter. I feed all year of course, but winter they go through tons of food. I would purchase school items/clothing . If I was lucky enough to win I would use it to buy my kids new clothes for up coming winter thanks for the chance to win! I would use it to winter clothes for my kids thanks for the chance! I would use it towards new winter clothes for my kids thanks for the chance! I would buy fall clothing if I won. Thank you! Clothes and lunch supplies for the school year. Thanks for the chance! I would buy fall boots for my girls. I would spend it on back to school clothes and supplies for my kids. I would buy a lot of school clothes and supplies! If I win I would buy Christmas gifts for the family. If I win, I will spend the $500 gift card on new bedroom furniture. I would use it to get my car serviced. I really, really, really need some cute boots and not because I want them, I actually need them. I also need some jeans and Tshirts….but i would mainly spend the money on sneakers for my 3 year old plus her fall/winter wardrobe and some things for my 10 yr old’school bts wardrobe…. I would spend it on clothing and school items for my kids. I will be buying tons of Back to School items! My son’s ESD Pre-School always can use snack donations for snack time. This could really help fill their cupboard! I use the gift card to pay off some medical bills and take my husband to dinner! Sorry I entered the wrong link in the form for my daily pin. here is the correct link. I would buy some clothes and also Christmas presents. I would most likely put it towards groceries and to pay some bills. If I win, I will spend the $500 gift card on a new mattress. I would buy my granddaughter school clothing as we just went through her closet and had her try on her clothes. 3/4 of all of her clothing is too small so we really need to get a start on things as school is starting in 2 1/2 weeks. I will use it to purchase back to school clothes for my son. I would spend it on hay for this winter for the feral cats and more shelters. I would spend it on school items and groceries. I might spend it on vacation expenses. I am going to buy school clothes with the money! I would buy back to school supplies! If I win, I will spend the $500 gift card on a new recliner. Something else I could use it for is a tablet for my sister to use. If I win I would use it for some Christmas shopping. this would be great for buying winter shoes for my little one. I would use it to purchase back to school clothes. i’m excited to listen to the stories my son tells me about his school day! If I win I would use the card to pay a few back to school bills! I would either spend it on a weekend road trip or buy my husband a recliner. I would spend it on a new computer for my family for school. I would buy my husband tickets to the volunteer Battle at Bristol game and my daughter a bday gift. I be buying school clothing items for my granddaughter who needs clothes badly as she has outgrown so many of them. I would use it to vet some of the feral cats and I know one had kittens just recently. I would also be able to do a few spays. If I would win I would get a portable washing machine. I would spend it on homeschool items and groceries. I am spending it on School clothes and supplies. School supplies for my son and his classroom. If I win, I will spend the $500 gift card on a cruise. I would use it to buy spinner luggage. Another item I could get is a replacement laptop cord, mine is starting to fray. I would spend it on a new dishwasher so that it will help me when school starts. It will be a busy time so having a dishwasher would help me a lot. i would buy Fall and Winter clothes , jackets and shoes . If I win I would use to buy a printer and new shoes and clothes for my kids. Honestly if I win I will put $100 in savings, $100 towards groceries. $100 towards back to school clothes. $100 towards family birthday presents. and $100 to send my hubby to go get a massage. It would be a blessing to win this to buy clothes for my 4 kids. I would use some of it for a wardrobe update. I will be getting back to school clothes and supplies! I would buy clothing and other items for school. I would give my neighbor’s kids a treat or buy them clothes they need for school. If I win, I will spend the $500 gift card on a new stand mixer. I would finish buying my son some clothes and use the rest for Christmas shopping. I would spend it on getting some feral cats spayed and neutered. Its expensive to do, but there are several who need it before winter. I would use some of it for dog food/treats. I would buy clothing that my granddaughter needs before she heads back to school. I would use it to help the feral cat colony I feed. Vetting, food and build more shelters. I would buy school clothes for the grandkids. If I win, I will spend the $500 gift card on a new printer. We could use the gift card to buy clothes for our vacation. I am getting school clothes and supplies! I would get holiday gifts with it. I would spend it on healthy groceries, and also on our next family road trip! Another item that I could get is a Kindle tablet. I would use it to maybe pay down some medical bills. We have a ton of those! If I win, I will spend the $500 gift card on artwork. I would use the gift card to buy back to school items. I’d buy clothes for my family. Thanks! I am buying School Clothes and supplies! I would buy clothes and shoes for my kids. I would spend it on school items! My washing machines transmission just went out so I would use it to buy a new one! I’ll use it on bills! I would use it to pay household expenses. I would spend it on the feral cat colony buying food and maybe another heated water dish for the winter. If I win, I will spend the $500 gift card on new wedding bands. I’d spend on clothing for back to school for my 4 kids! I would spend this on books and school supplies for homeschooling my five year old this year. We would use it for groceries. I am going to get a lot of back to school clothes and supplies. I would use it on our vacation in September. I would spend the $500 gift card on items that my grandchildren need for back to school. This would help buy school clothes ad also gifts for Christmas. After being mom’s unpaid caregiver for 10 years my sweet mama recently passed away. I’m panicing about money – this would be used for bills! I would also but some aside for school supplies. Back to school shopping will be first on the list should I win this gift card. I would spend this on some home improvements. Our roof is a mess we could apply it toward that. I would use to surprise my husband with Battle at Bristol tickets and some clothes for my daughter. I would stock up on meat in the freezer for the winter. I’d use it mostly on groceries and maybe the next family road trip. I would spend it on clothing and school items for the kids. I am going to buy some awesome back to school clothes and supplies. Thanks for an awesome giveaway!! We would use the prize to help pay for vacation expenses like tickets to the aquarium. Id buy groceries and fall clothes for my little one. If I win, I will spend the $500 gift card on barstools. If I win I would do a lot of shopping. I would spend the $500 on a new laptop. It will go for bills. If I win, I will spend the $500 gift card on a new dishwasher. I would spend it on getting a female cat fixed and vetted along with her kittens. The $500 gift card would be spent on the grandkids for items they need in order to return to school. My daughter desperately needs a new laptop. That’s what I would spend it on. Cases of cat food for my cat….Wellness minced turkey gets expensive! I also need a new pair of sneakers. Thanks for this awesome giveaway! I am getting school supplies and clothes with this money! This would help with Christmas shopping. I would use it for clothes and other back to school items we haven’t bought yet. I would use it on clothes for the kids and also our next family road trip! I would use the gift card for new clothing, shoes, backpacks and school snacks for my kids. It would go for bills and a cremation necklace for a little of my mom’s ashes. I would put some of it aside for my dog’s heartworm medicine. The car needs 2 new tires. 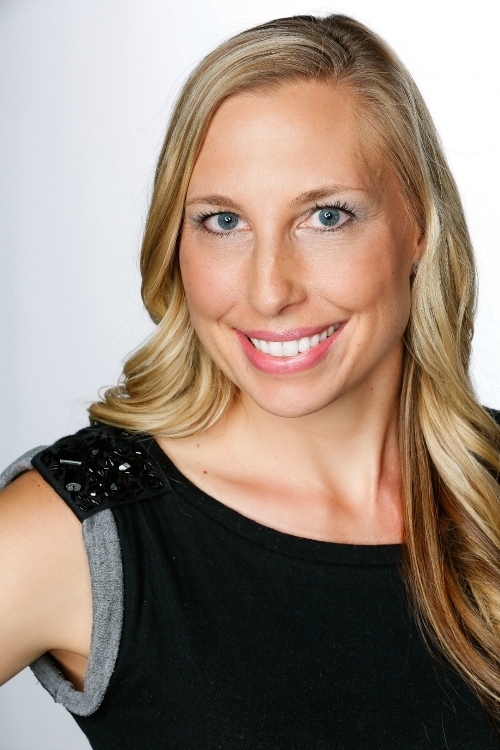 I will pay some bills & treat my BFF to a kid free girl’s night out on the town! I have 3 children, 2 of which who are in school. I would buy back-to-school clothes and school supplies for my school age children and some Winter clothes for my newborn. It’s time for some new tires for my car. If I win, I will spend the $500 gift card on a new refrigerator. I would use the money to get a female cat spayed before she has anymore kittens. I would also get another trap as they one we have is getting pretty used up!